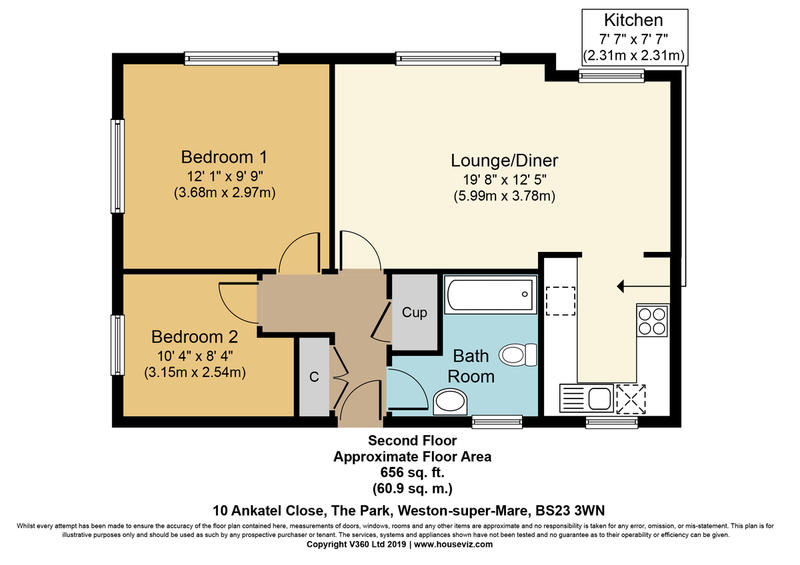 SUIT FTB OR INVESTOR - 2 bed 2nd floor flat with lounge, kitchen, bathroom and parking space. Enjoys electric heating, DG. Tenant in residence would like to stay if possible, but would equally suit first time buyer. A modern purpose built 2nd floor flat, within this block built with elevations predominantly of facing brick and render under a pitched tiled roof. The property enjoys UPVC double glazing, electric heating, parking space and currently has tenants insitu paying £650 per calendar month, who are keen to stay if possible. ENTRANCE HALL Entry telephone, electric wall heater, loft access, double doors to double built-in storage cupboard, AIRING CUPBOARD housing factory insulated tank. KITCHEN 7' 7" x 7' 7" (2.31m x 2.31m) Fitted with maple effect units comprising double and single wall cupboard, single bowl single drainer stainless steel sink with mixer tap over, single cupboard under, further base cupboards and drawers, roll edged worktops, tiled surrounds, space for fridge/freezer, 4-ring electric hob, stainless steel extractor hood and light over, electric oven under, plumbing for washing machine, vinolay flooring, UPVC double glazed window. BEDROOM 1 12' 1" x 9' 9" (3.68m x 2.97m) Dual aspect with UPVC double glazed east and south windows, electric wall heater. BEDROOM 2 10' 4" x 8' 4" (3.15m x 2.54m) narrowing to 7'10" (2.39m) with UPVC east facing window, electric wall heater. BATHROOM White suite of panelled bath with mains mixer shower over, pedestal wash hand basin with splashback, low-level WC, tiled surrounds, extractor, Dimplex electric wall heater. OUTSIDE Parking space. Secure dry storage shed 3' 6" x 2' 8" (1.07m x 0.81m) approx. TENURE Residue of 155 year lease from 2004. Ground rent £150 per annum. Maintenance £51.36 per calendar month including Buildings insurance.